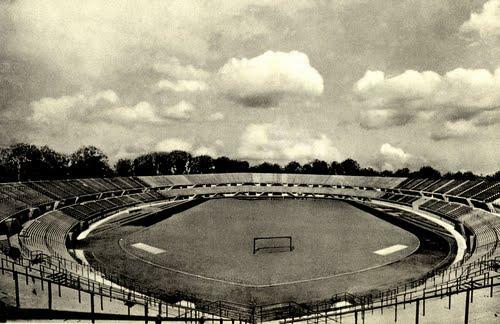 Ernst Happel Stadion, initially called Prater Stadion, got built between 1929 and 1931. A new large omni-sports stadium had been a longstanding wish of the city of Vienna. Construction of the stadium took 23 months, and it officially opened on 11 June 1931 with the Workers Olympiad. The stadium consisted of two bowl-shaped tiers that could hold about 60,000 spectators. 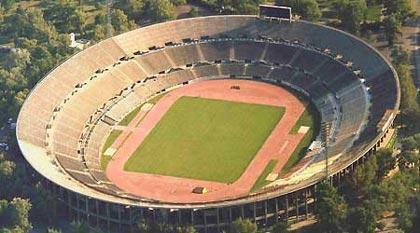 However, with the increasing popularity of football after the war, the Prater Stadion was soon in need of expansion. In 1956 therefore a third tier was added to bring capacity to 91,150. A few years later, in 1960, a record attendance of 90,726 was set during an international between the Austrian and USSR national teams. By the 1980s, several standing areas had already been converted into seats, hereby reducing capacity to just over 70,000, when in 1984 a grand redevelopment was announced. The works included the construction of a roof and the conversion of the stadium into an all-seater. Capacity was further reduced to under 60,000. In 1993, the name of the stadium was changed to Ernst Happel Stadion in honour of the legendary Austrian player and manager. Ernst Happel Stadion was further refurbished for the Euro 2008 tournament, which included the placement of temporary bleachers in front of the permanent stands. During the tournament, it hosted three group matches, a quarter-final, a semi-final, and the final between Spain and Germany (1-0). Over the years, the stadium hosted four Champions League and European Cup finals, starting in 1964 with the final between Internazionale and Real Madrid (3-1), followed by Porto versus FC Bayern (2-1) in 1987, AC Milan versus Benfica (1-0) in 1990, and Ajax versus AC Milan (1-0) in 1995. 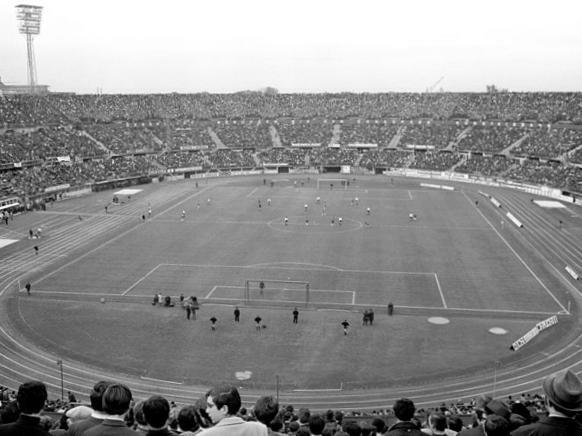 Ernst Happel Stadion furthermore hosted the 1970 Cup Winners’ Cup final between Manchester City and Gornik Zabrze (2-1). Between 2014 and 2016 the stadium was the home of Rapid Wien while they built the new Allianz Stadion in place of their old Gerhard Hanappi Stadion. In 2016, it was the turn of Austria Wien to move into the stadium when they started works on rebuilding their Generali-Arena, which will be finished in 2018. 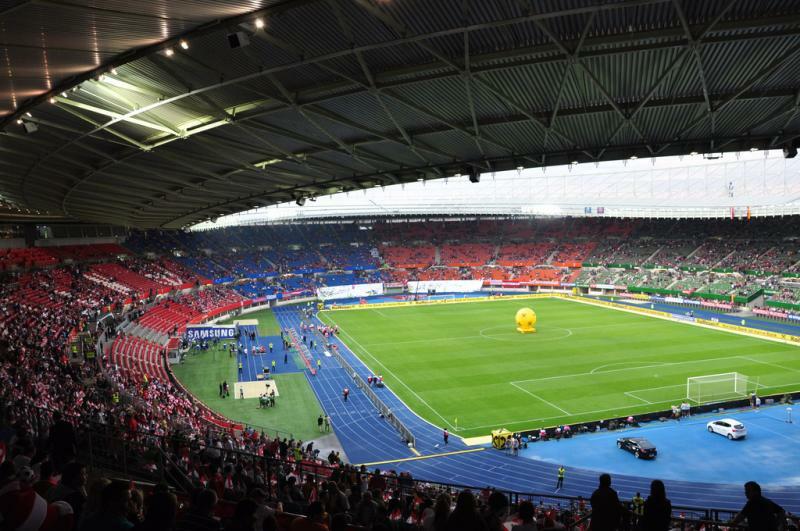 Over the years, Ernst Happel Stadion has significantly aged, and the Austrian FA has therefore expressed the desire to build a new national stadium. However, at the moment there seems little appetite from the city to build an expensive new stadium that would only get used a few times per year. Ernst Happel Stadion is located about 3.5 kilometres east of Vienna’s inner city on the edge of the Prater Park close to the Danube river. Vienna’s famous ferris wheel, also in the Prater Park, lies about 2.5 kilometres north-west of the stadium. The stadium can be easily reached with metro line 2. Station Stadion lies right next to the stadium. Line 2 runs along the northern and western edge of Vienna’s city centre. Ernst Happel Stadion is squeezed in between the Prater Park and Danube river, mixed up with some other sports facilities, the city’s conference centre, some retail, and some residential buildings. Right across the road from the stadium is the Stadion Center shopping mall, which also offers some food outlets, but generally the options for eating and drinking are rather limited and it is better done in the inner city and surroundings. The Prater Park is very nice though on a summer’s day, and the fair with the famous ferris wheel is also (just) at walking distance. Due to the vicinity of the conference centre, there is a decent amount of hotels close to Ernst Happel Stadion. The Hilton Vienna Danube and Courtyard by Marriott Wien Messe are only a few minutes walking from the stadium, but obviously come at a price. The Austria Trend Hotel Messe is somewhat more affordable. Instead, you could also strategically choose your hotel at a location between the stadium and the inner city, so that both are at walking distance. The Suite Hotel 200m zum Prater is on the other side of the park toward the centre. Hotel Urania, Hotel Adlon, and Hotel Cristall lie close to the fair and are reasonably priced. There are also various apartment rental options in the area. Click here for all hotels near Ernst Happel Stadion. If you wish to stay in Vienna’s inner city instead, then here are some options. Ticket sales for matches of the Austrian national team go through the OEFB Austrian football association. Wien.info – Online travel guide for Vienna. Wienerlinien.at – Vienna public transport information. I went to watch Austria Vienna against WAC few days ago. Tickets are easily available on the day( I paid 22 euros) and the programme is free( available on turnstiles). Getting to the stadium is very easy as there is a metro station just outside. I like the colourful layout of Ernst Happel Stadion. The experience would have been better with bigger attendance as only 6000 spectators turned up. With Austria finishing their own stadium next year the only chance to catch a game at the national stadium will be an international game. Vienna is a nice city so I would recommend everybody catching a game after a day of sightseeing there. Plenty of food outlets inside with hot dogs, burgers and fries.